I have 2 satsuki,imported from japan 2015.Both need repotting.I have read that I should remove centre,of rootball,up to bass of trunk,is this correct.They are both in Kanuma,which is very hard.Can you give me any help on best way to repot.I live in South Wales,UK. I’d love to hear from an azalea pro on this. I typically don’t aim to get to the bottom of the trunk when repotting satsuki unless the tree has been cleaned to that point before. Pure kanuma is great for satsuki, or sometimes kanuma mixed with pumice for additional drainage. Can you give more information? Photo’s, size of Azalea, health etc. Hi Susan,the trees where imported in Jan.2015 and are fully acclimatized.They are both 40cm tall and are in good health.I was told by the dealer not to repot till 2016.The Kanuma,in pots,is solid so I don’t think they have been repotted for some time.I would like to put some pics on but not sure how to do it.There is a thread on the site which says,click the image icon but cannot see it.Peter. Hi Peter, I stumbled on the photo icon its the underlined arrow. Not sure how it works haven’t tried it yet. I know exactly what you mean by the Kanuma being solid, it is one of the reasons I dont use it. Even though it is an excelent growing medium for Azaleas., because it is acidic. The only way to remove it is slowly, using a hook to slowly break it away, or a chop stick to help break it. Note also you will not be able to completely remove it. What happens is the the Kanuma is porous and the fine Azalea roots tend to grow into it. Here is a site that shows the repoting of an Azalea planted in Kanuma you will note that all of it is not removed. 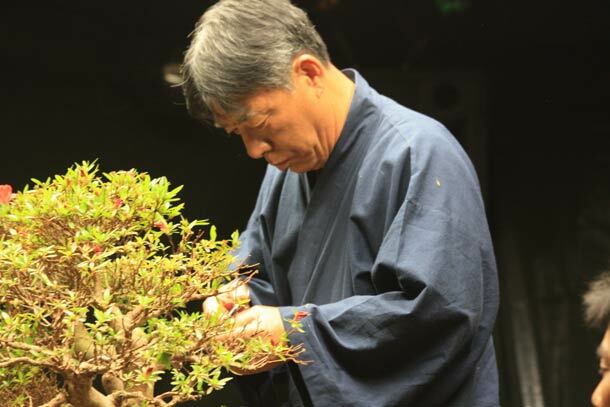 With regards to your question of hollowing it out under the trunk if the Azalea is well established, only minor scraping/hollowing is required, as the nebari would already be trained. So generally all you would be removing are the sides and top layer and scraping the bottom straight. But I must stress to go slow. My first experience was to break clumps of roots which was not what I wanted to do. And it took ages. So allow your self the time to take it slow and just chip away at it. They are very helpful Arthur is the chaps name. I asked around and was given this tip. I have had a few, the worst is the fine one, which I use for growing on seedlings! But even with the medium or large one I’ve experienced it in some cases and the best way I found to resolve the problem is to take the plant out of the pot and soak it, gently squash and shake it - it’ll loosen up! Now the “important step” for re-potting is to mix in some sieved medium sized Diatomite with your Kanuma, which will prevent the forming of “concrete” again! Hi Susan,Have put pics on,dont know how to reduce size yet.Looks like they have been repotted,they haven’t.I put kanuma on because there where very low levels around pot.Thanks for the tip. I put the pics on,after clicking the icon,by drag and dropping.